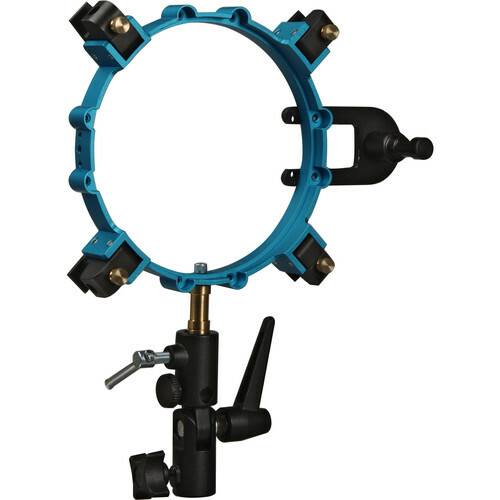 This Chimera Quick Release speed Ring allows mounting of Chimera, or almost any other brand rectangular video-series softbox to the Lowel Tota Light. The Quick Release Series releases the tension of the wands in the frame of your softbox, allowing it to collapse easily for breakdown, or for moving on quickly to the next setup without disassembling the box. The included Heavy Duty Swivel Stand Adapter re-centers the fixture and softbox combination over your light stand for a more stable setup. Box Dimensions (LxWxH) 11.0 x 10.7 x 2.8"
Quick Release Speed Ring for Lowel Tota Light is rated 3.0 out of 5 by 2. Rated 5 out of 5 by Helen from Works well Turns the Tota into a good source for softboxes (if they are rated for hot lamps of the wattage you have in the Tota of copurse). The QR feature is convenient. The cable can be plugged in after the Tota has been mounted to the speed ring - I used the standard IEC C15 cable that Lowel supply. Rated 1 out of 5 by SAgnew from Doesn't Fit Correctly! The design impinges the power cord socket on the tota light - it is difficult to impossible to plug in the AC cord either before or after attaching the tota to the speed ring.